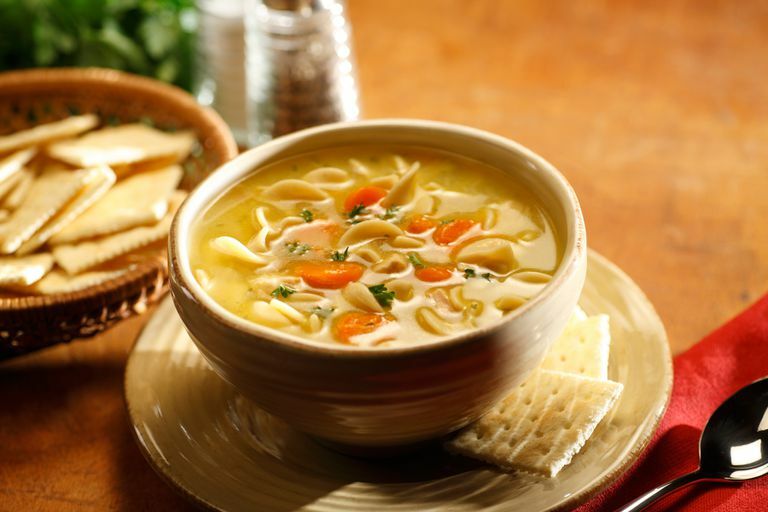 This Heartburn-Friendly Chicken Noodle Soup with Vegetables is comfort food in a bowl. Previously, a no-no for heartburn and acid reflux sufferers, this low-fat version makes this classic feel-good food available to those with digestive-system issues. Most chicken soups are iridescent with globules of golden chicken fat. Fat is a known trigger for heartburn and acid reflux discomfort, so this recipe made with previously cooked boneless, skinless chicken breasts is a godsend. If the chicken breasts are cooked in advance, this easy soup recipe can be ready in about 35 minutes, from start to finish, making it an ideal busy weeknight meal. Add 1/2 tablespoon olive oil to a large pot. Add 2 cup trimmed and chopped celery and sauté over a medium-high heat until translucent. Add 2 quarts water, 2 cups peeled and chopped carrots, 4 low-fat chicken bouillon cubes, 1/2 teaspoon thyme, and 1/2 teaspoon salt. Bring to a boil. Add 2 cups (3 ounces) large egg noodles to the boiling water. Stir. Return to a boil, reduce heat and cook for 8 minutes or until noodles are tender. Add 2 cups diced, cooked boneless skinless chicken breast meat and 2 cups frozen peas. Return to a boil, reduce heat, cover and simmer over medium-low heat for 5 to 10 minutes. It's not a bad idea to cook up a batch of boneless, skinless chicken breasts (using your favorite cooking method—grilling, poaching, baking, sautéing, pan-frying, steaming, etc.) and then freeze them to have on hand for recipes calling for cooked chicken, such as this one. Since frozen chicken breasts thaw very quickly, you can have a yummy meal on the table in no time. It's a better idea to freeze whole cooked chicken breasts rather than diced chicken meat. The latter will dry out more quickly. Some recipes will call for cups of diced chicken, as this one does, but others will refer to whole breasts that are then diced. So, if you like, you can dice some chicken breasts and leave some whole. Freeze in a zip-top bag or other containers for 3 to 4 months.